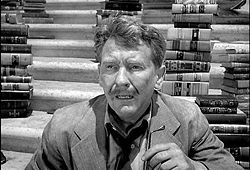 Henry Bemis, the compulsive reader whose tragedy was limned in a short story by Lyn Venable and dramatized for television in a 1959 biopic written by Rod Serling for an episode of The Twilight Zone that made Bemis a champion to reading geeks worldwide, is dead after a gallant, fifty year struggle with the cumulative effects of eye strain and radiation poisoning. Bemis, a bank teller cruelly henpecked by his wife and brow beaten by his boss for a reading habit that they considered a waste of time, was eating lunch one day, secluded in the bank’s vault and cozying up to a book, when Nuke War I broke out and ended within thirty seconds. Protected by the vault, Bemis emerged into a crumbled and depopulated Reading, PA, his home town. Alone and bereft, he was on the verge of suicide when he noticed that within the ruins of the local library were thousands of books waiting to be read. Now with Time Enough at Last (the title to Serling’s Twilight Zone episode) to read as much as he wanted to without interruption or opprobrium, Bemis had just opened a book and was eager to begin reading when he reached to pick something up and his glasses fell to the ground and shattered. With all the books in the world and all the time to read them but no way to do so, Bemis' story put the "Ai!" in irony, and an entire generation of pubescent book freaks, present writer included, learned that they were not alone, that there was someone like them, a nerd with a need to read - and to always have a back-up pair of corrective lenses safely tucked away for emergencies. Bemis died peacefully in his sleep after listening to an audio edition of Mortimer Adler's How To Read a Book narrated by philosopher of the simple life, crypto-intellectual, and Mr. Bemis' final companion, Paris Hilton, the closet bibliophile whose vast and singular collection of first editions is centered upon volumes containing the word "Paris" in the title, Collins & Lapierre's Is Paris Burning? (1965) her favorite: "It's hot," the trend-setting heiress declares, "and so was Henry. He was so cuddly, like a giant Chihuahua. I just wanted to read him all over. I'm writing an article about him, for The Paris Review, of course." "I'm heartbroken," bibliojournalist and author Nicholas Basbanes said. "I knew Henry. In fact, I was planning an entire book about him, A Pathological Madness. You know, afterward, when the radioactive dust had settled and the world began to rebuild, he was fitted for a new pair of glasses. But his retinal rods and cones had, over time with atomic pollutants, deteriorated to the point where his eyeglasses were essentially glass bricks with earpieces. Wearing them wreaked havoc with his posture and self-image; he actually thought of himself as a leading man type and was disappointed when Burgess Meredith was cast to play him in the famous Twilight Zone episode - he had hoped that Rock Hudson would be chosen. (Hudson was, at the time, essaying his greatest acting challenge as Brad Allen, heterosexual pursuer of Doris Day in Pillow Talk). The improvement to his vision was, at best, marginal, so he refused to wear them and went slowly insane trying to decipher ultra-fuzzy text. Though he was completely unfocused, I've never met a more intense and determined man. "The book world has lost an Olympian reader," Basbanes eulogized, "and one of it's greatest supporters. I'll miss him." A memorial service will be held at the former site of Heritage Book Shop on Melrose Avenue in Los Angeles, the famed L.A. landmark building originally designed and constructed to house Pierce Brothers Mortuary, Hollywood's undertaker to the stars. In lieu of flowers, Mr. Bemis requested that he be buried with donated copies of Baudelaire's Fleurs de Mal (1857), Burne-Jones' The Flower Book (1905), Darwin's The Different Forms of Flowers on Plants of the Same Species (1877), Rebecca Hey's The Moral of Flowers (1836), Thomas Hogg's On the Flower That Holds the First Rank Among All the Flowers in the Garden (1820), Crane's The Flowers and Folklore From Far Korea (1931), and 1,432 other floral first editions in his casket, a cargo container to be interred in Forest Lawn's necropolis for dearly departed bibliophiles and New Orleans prostitutes, Storyville. "You can take it with you, and I'm going to!" Bemis is reported to have asserted in his will. "You don't need glasses in Heaven." Finally, Henry Bemis truly has Time Enough At Last. And so end "the best laid plans of mice and men and Henry Bemis, the small man in the glasses who wanted nothing but time...Mr. Henry Bemis in the Twilight Zone" (from Rod Serling's teleplay). Time Enough at Last originally aired November 20, 1959 on CBS as episode eight of season one of The Twilight Zone. It is, arguably, the finest, certainly the most poignant, screen depiction of the passion for books and reading ever filmed. Its themes of bibliophilia, anti-intellectualism, and solitude versus loneliness remain timeless. View the full episode of Time Enough At Last here. Bemis, a bank teller cruelly henpecked by his wife and brow beaten by his boss for a reading habit that they considered a waste of time, was eating lunch one day, secluded in the bank's vault and cozying up to a book, when Nuke War I broke out and ended within thirty seconds. Protected by the vault, Bemis emerged into a crumbled and depopulated Reading, PA, his home town. Alone and bereft, he was on the verge of suicide when he noticed that within the ruins of the local library were thousands of books waiting to be read. Now with Time Enough at Last (the title to Serling's Twilight Zone episode) to read as much as he wanted to without interruption or opprobrium, Bemis had just opened a book and was eager to begin reading when he reached to pick something up and his glasses fell to the ground and shattered.